Big as the world is, I still meet you. As the leader of the inverter field, rigorous and steady are our attitude. We continuously innovate in the pursuit of perfection. When you know that our inverter is ahead of other inverters in the industry, you will surprise when you use our inverter. 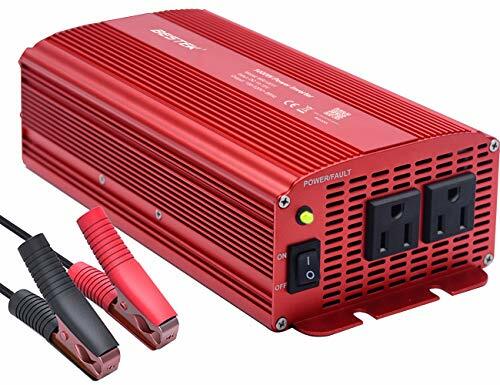 800W--Normal vehicle equipment do not need that much power, and the power is not enough to meet more extensive use. Such as household appliances etc. Global Brand: Unlike ordinary adapters and converters, BESTEK, is the supreme global best seller in car power inverters. It's 18-month warranty covers 23 countries, and has a 24H personal support service for you. Highlights of Capability: Cope with power outage emergency, a life saver in extreme weather. Excellent choice for long car trips, camping, outdoor activities, electronic devices charging, such as laptop, lights, digital camera, crockpot etc. Full Power: Dual AC outlets provides 1000W continuous DC to AC power and it's peak power reaches to 2400W to keep your connected devices running and charging. Safety Protection：3 external fuses and a built-in cooling fan to avoid overload, overheating, short circuit and low battery shutdown. 8 protection mechanisms to ensure the safety of your car and family. Compact and User-friendly Design: Adopted advanced aviation materials, it provides extraordinary experience of high-tech design. Power your appliance by using battery clamp to connect the inverter directly to the car battery.